Perhaps no generation of youngsters has grown up socially amidst such far-reaching changes as the young people of the nineteen nineties. As well as changes directly or indirectly arising out of changes in the political system, the current younger generation is linked with a change above and beyond the current of social transformation. These are changes stemming from the transition to an information society through new information and communication technology. This is leading to the digitalisation of the scope and lifestyle of the younger generation. For young people life is shifting to cyberspace and the natural world is being replaced by virtual reality. The standing of information and communication technology in the lives of the younger generation shows the extent to which computers are used in leisure time. The most frequent leisure-time activity is still watching television, which tops the list of free-time pursuits and continued to increase until 1997. 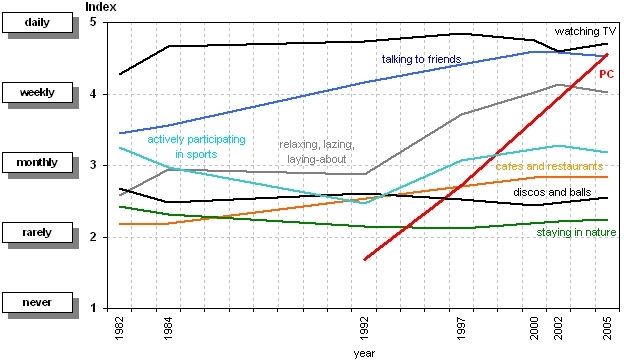 The rise in the use of computers for leisure activities is shown by a time series of surveys into leisure time. The graph shows the average choice of activities for young people aged 15-18. The graph shows a sharp rise in the use of personal computers since 1992. While in the past it took generations for innovations to permeate society and become part of everyday life, the saturation of society by sophisticated innovations such as the personal computer doubtlessly is, has taken place within the social age of a single generation, as the graph illustrates. If we compare the leisure-time activities of young people (age group 15 – 30) with the older population (over 30) and if we look for those activities more popular with young people, we see that the greatest difference lies in “studies and preparation for school”. This activity is a natural phase of life and can be expected. The second biggest difference in how leisure time is spent appeared in the time devoted "to the computer". 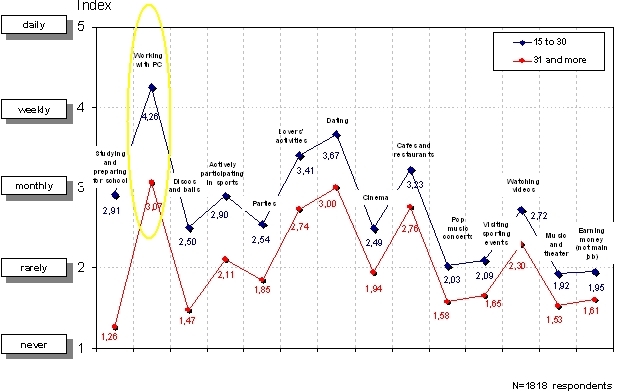 Graph 2: Leisure-time activities in age groups I.
Graph 2: Leisure-time activities in age groups II. In addition to other activities the range of leisure-time activities includes “work on the computer”. The use of computers and the internet is not simply one of many leisure-time activities, as young people use the internet and personal computers to do a wide range of things. These include activities enjoyed by the younger generation before the era of computers too, such as photography, making video films, music, literature and graphics, as well as activities and modes of behaviour which are not only restricted to free time. These are mainly activities related to information – looking up facts, processing and using them, and communication. The upcoming younger generation is growing up in a multimedia environment of fast communication. Communication using words is often replaced by communication using icons. For this generation new communication and information technology is becoming a real extension of their way of thinking, a world parallel to their physical world. Communication using these forms of technology is a natural part of everyday communication for them. New communication and information situations create a new kind of person whose lifestyle and scope are becoming digitalised. The new denizen of the information society in the digital age is on-line man. People in the network, permanently ready to communicate in cyberspace, into which the entire computerised civilisation is being transformed. The person on-line is always within reach of a civilising wealth of digitalised information and data continuously flowing into the network. The younger generation is already being characterised as the “net generation”. Communication has acquired a new characteristic. While mass media led to a form of communication where a “message” was sent out en-mass to recipients who were mutually isolated and mass communication was characterised by this one-way flow and isolation, the new forms of communication are characterised by not only by two-way interactivity, but also by the opportunity for multidirectional communication amongst everyone. Each person forms a point on the communications field, within which the position of the sender and recipient of the message, the creator and the consumer of information, switch positions with varying degrees of frequency. As part of spontaneous communication within the network spontaneous virtual entities are formed, based on different aims and functions. As an example we can take the self-organising entity of the creators of Wikipedia. In cyberspace chat a room is created in which, over the months, a virtual social entity is created out of visitors – elements with a virtual identity. The situation sometimes reverses after months of virtual existence and this new social entity transforms from virtual reality to the natural world and a metamorphosed social community emerges into natural temporal space. The standard member of the current younger generation, the net generation, in contrast to previous generations whose members were characterised socially by their standing in society and social roles, now has a new dimension of existence; these are his or her virtual characteristics and the characteristics of life in cyberspace. Girls and young ladies enjoy romance through virtual dating sites, yet with the growing index of computerisation the importance of children and family as values is falling. The current younger generation is the first generation to grow up and socially mature with this new technology and on the net. This is why it is so different from the older generation, which encountered new forms of technology in situations already entrenched in their way of life. People tend to apply their way of using earlier forms of media when using the new forms, if they have developed "user habits" with older media. The older generation grew up in the era of books, later with television. Even when using new media they “look for” these media. Just as the older generation will wane, so will the digitalised way of life come to predominate, the core of which I will use to derive leisure-time and work activities, will be the computer and internet. Computers and the internet are, however, new opportunities for senior citizens, the proportion of whom continues to rise as the average lifetime gets longer. For senior citizens the computer offers the chance to send their intellectual products electronically, instead of actually moving themselves physically. E-work brings the senior back into the work process and into society. The e-society entails a boost to man’s brain and functions, allowing him to communicate and work with information, while at the same time weakening the physical performance of the body. These days emphasis on the body is not emphasis on physical function and performance, but is an emphasis on the body as a symbol of social status. As a white body used to be the symbol of higher social status, at other times a tanned body has been a status symbol. The emerging on-line man is at risk of becoming a point in the network which is a channel for information, which communicates at high frequency with a multitude of similar points on the network. There is the risk that the deep-seated layers of personality and rare human skills such as intuition, creativity, empathy, etc., will atrophy or even fail to develop in on-line man. Although the members of the older generation also use new information and communication technology, the position of these forms of technology in their lives differs. Their social maturity, including the assumption of various tools, media and technology into their code of behaviour and way of life, took place before the rise of the new technology and these new forms of technology become part of a rounded, complete "model of life". The younger generation, however, is creating a new "model of life" whose focal elements are new information and communication technology. This new model is being formed gradually, just as even more perfect forms of next-generation technology are entering society, bringing new possibilities and greater user-friendliness. An example of the differences between the generations can be seen in their cultural life. The younger generation is continually getting more connected with cyberculture, which is booming. Changes also arise from the shift from the natural world to cyberspace, which appears as a dependence on the computerisation index, with less time being spent in the countryside, working in the garden or looking after animals. Other activities made available through computers and the internet include education, which interests young people and a part of the younger generation makes use of electronic education. E-learning doubtlessly diversifies educational opportunities, yet there is the risk that there will be attempts to apply e-learning in situations where the teacher and his or her personal interaction with the pupil are irreplaceable. As the graph shows, young people make much greater use of all the educational opportunities offered by computers and the internet than the population as a whole. In contrast with the previous generation, Czech youngsters devote themselves much more to alcohol, smoking, and, since the nineties, drug use. One surprising thing that the computerisation index shows is that drug use is rising along with computerisation. When seeking the common denominator in these activities we could perhaps name the transition from the natural world to cyberspace or an altered state of consciousness. The approach to drugs in the Czech Republic is becoming much more liberalised, particularly amongst young people and politicians. This generational divergence of lifestyles means that the younger generation is moving towards cyberculture, from the natural world to the virtual reality of cyberspace and the passage between them, and towards the satisfaction of interests and needs through computers and the net. 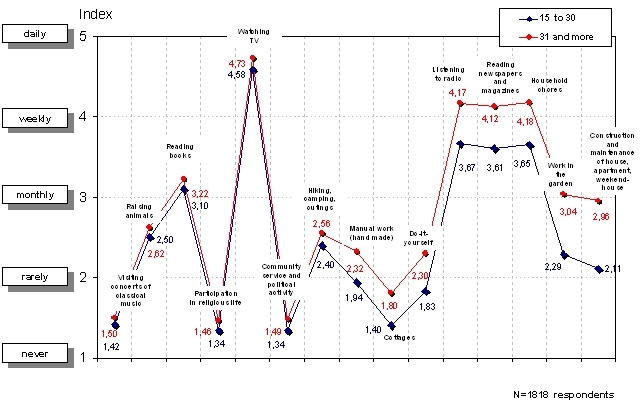 The time series of surveys was carried out from 1982 to 2005 by the same author and using the same methodology. Respondents were assessed on 44 leisure activities by the frequency with which they indulged in a particular pastime: 1-never, 2-rarely, 3-sometimes, at least once a month, 4-often, at least once a week, 5-daily, or almost daily. An average index was calculated for each activity in the 15-18 age group. 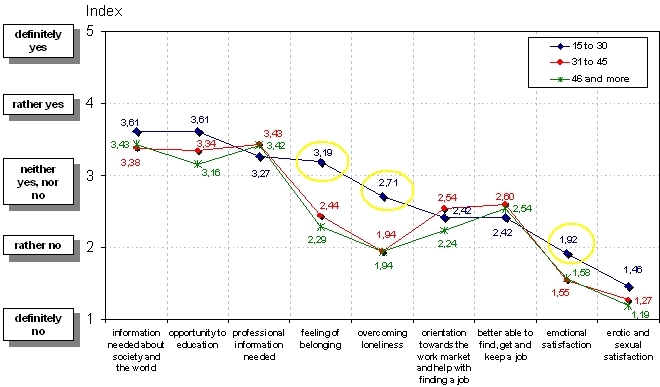 The actual data used comes from empirical surveys performed under a grant from the Ministry of Labour and Social Affairs of the CR, entitled “Affect of computerization on education processes and on the figure of man in the information society”. This entailed: 1. a representative survey of the Czech population, the data for which was acquired using a standardized interview with a selected group of 1818 respondents. 2. a survey carried out at primary and secondary schools; data was acquired through a questionnaire; 772 questionnaires were used.